Reader Q&A: What are the Best Antioxidant-Rich Sunscreens? Calysta Labs Clarifying Charcoal Peel-Off Mask: An Essential for Reducing Pore Size! Olive oil is a fat obtained from the olive (the fruit of Olea europaea; family Oleaceae), a traditional tree crop of the Mediterranean Basin. 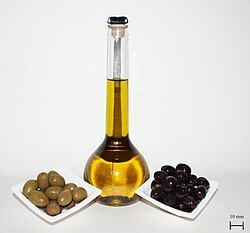 The oil is produced by pressing whole olives and is commonly used in cooking, cosmetics, pharmaceuticals, and soaps, and as a fuel for traditional oil lamps. Olive oil is used throughout the world and is often associated with Mediterranean countries. Adulteration of olive oil is widespread, with involvement by organised crime.